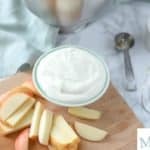 Yogurt fruit dip is a fun and healthy recipe that will give fruit an extra creamy and sweet twist. 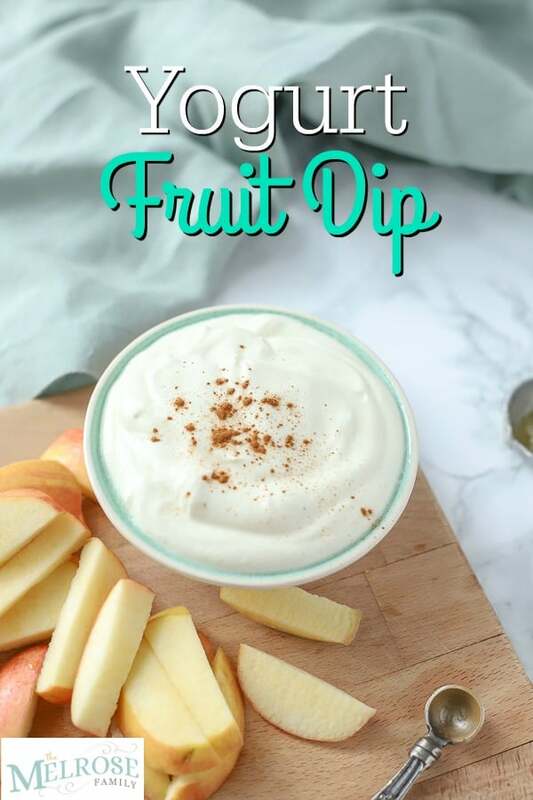 Made with just 3 ingredients, this easy fruit dip recipe is perfect for after school snacks or parties. Follow my tips below to make our favorite yogurt fruit dip. 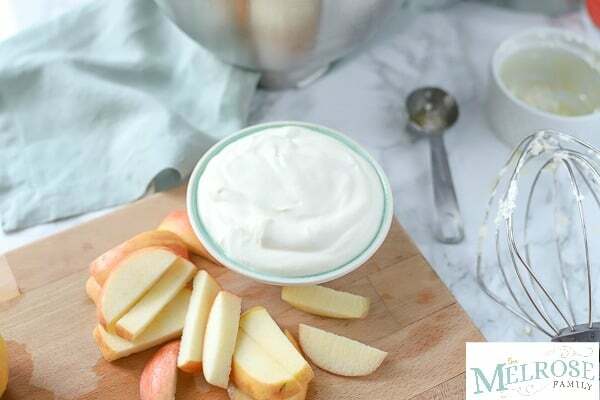 Ingredients you will need to make this yogurt fruit dip: yogurt, heavy whipping cream, honey or maple syrup. I’ve turned Avery into a whipping cream fanatic. Every time I go through our local coffee shop’s drive through with her in the car, she begs for whipped cream. It’s just a tiny little cup she can snack on quietly while we get to the next place we need to go. Honestly, I don’t really mind. Everyone is happy and quiet, and that’s what us moms like, right?! As much as Avery loves whipping cream, she isn’t a huge fan of yogurt. Usually, to get her to eat yogurt, I will have to make it into frozen yogurt or popsicles, or something. For her to eat it, I have to jazz that yogurt up a bit. But I love that yogurt is full of probiotics, calcium, and other beneficial stuff. So I figured if I added something she loved, like whipped cream, to yogurt, it may just get her to eat it. Well, it worked. She wolfed down this delicious, healthy, and fluffy yogurt fruit dip. You’ll notice that I used whole milk yogurt in this recipe. If you are trying to eat low-fat, then you can switch it to lower fat yogurt. We just love whole milk yogurt, and feel like it helps us stay fuller longer. And not having a kid nag constantly saying she is hungry and needs a snack for the thousandth time that day is winning. Slice up your fruit while the whipping cream is whipping. Add the honey to the whipping cream when the whipping cream is just about done. That way it gets more evenly dispersed. For an extra healthy boost, sometimes I like to add a scoop of collagen peptides to the whipping cream. This adds some extra protein and collagen to your healthy snack. 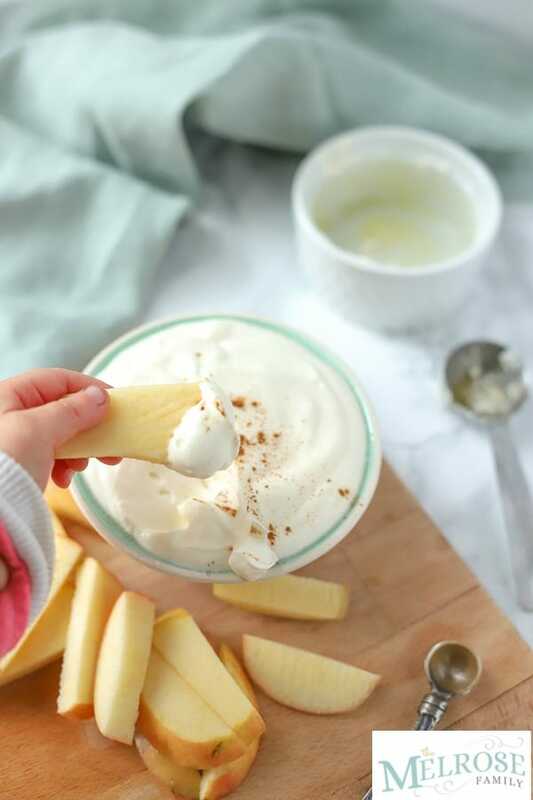 For a yummy twist on the flavors, add a sprinkle of cinnamon or pumpkin spice to this yogurt dip recipe. You could also top this dip with some chocolate chips, marshmallows, dried fruit, or nuts. This post contains affiliate links. We are a participant in Amazon Services LLC Associates Program, an affiliate advertising program designed to provides means for us to earn fees by linking to Amazon.com and affiliate sites. We only link to products we use and love or would use. You only need a few tools. A stand mixer or hand mixer, bowl, and spatula. Gather ingredients: heavy whipping cream, yogurt, and honey. 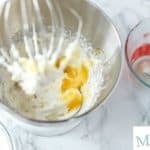 With a stand mixer or hand mixer with the whisking attachment, whisk heavy whipping cream until nice and fluffy; about 5-10 minutes. 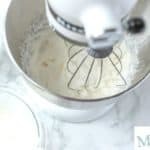 Turn mixer to low or medium-low and add honey. Gently fold in yogurt, being careful not to take out any of the air from the whipping cream. Serve with sliced fruit. Enjoy. Recipe note: you can store this yogurt fruit dip in an airtight container for up to 3 days. The quality will start to decrease after a day or two, so try to eat it quickly. Although, it will probably be devoured fast. Want more healthy snack ideas? Try some of my favorites! Blueberry And Lemon Energy Bites are a fun snack. Gluten Free Apple Muffins are so delicious, and smell amazing. Healthy trail mix cookies are a healthy snack, or even an on-the-go breakfast. Or try these Healthy Carrot Cake Breakfast Cookies that could also be a yummy snack. A healthy and fluffy twist on a yogurt fruit dip recipe. Your family will love this recipe, and you will love that this recipe is made from healthy and simple ingredients. This recipe is easy to make, and only take 10 minutes start to finish. Yogurt fruit dip is a fun and healthy recipe that will give fruit an extra creamy and sweet twist. 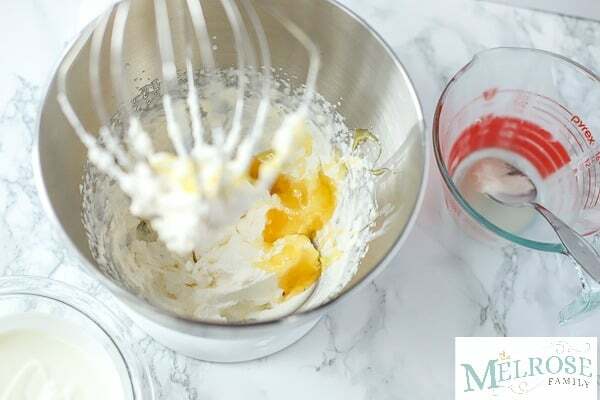 With a stand mixer or hand mixer with the whisking attachment, whisk heavy whipping cream until nice and fluffy about 5-10 minutes. Turn mixer to low or medium low, and add honey. Gently fold in yogurt being careful not to take out any of the air from the whipping cream. You can store this in an air tight container in the fridge for up to 3 days. It may lose it's fluffy quality after a day and the whey may start to separate after just a few hours in the fridge. Just pour it off. Yes; the dip will be much thicker, though, so keep that in mind. What fruit will work well for this fruit dip? Strawberries, apples, raspberries, sliced bananas, pineapple, blueberries… just about any fruit will do. I like to do easy dipping fruit, like apple slices and strawberries. Can you use vanilla yogurt in place of plain yogurt? Yes, I would just make sure to adjust the sweetness, since vanilla yogurt typically has sugar already added into it. You may just need to use less honey. 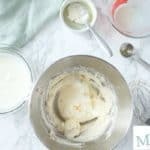 Can I make vanilla yogurt out of plain yogurt? If you want to give this a vanilla flavor boost, add a 1/2 tsp vanilla extract to the mixture. Can I use non-fat or low-fat yogurt? Of course. The texture may be a little different, but you can definitely make the swap. I like using whole milk yogurt because of creaminess and it makes us feel fuller longer. What is your favorite fruit you like to pair with yogurt fruit dip?